Roanoke, Ill. - Postseason basketball doesn't start for another week at the 3A/4A level, but the small schools got a head start on Monday night, as Roanoke-Benson played host to Elmwood in a 1A Regional Quarterfinal. Neither team had a true advantage early, battling back and forth in a close game, or so it appeared that way at the onset, with Elmwood holding a slim 14-13 lead after the first quarter. Someone had to take a strangle hold on the momentum of the game, somebody's got to win. It looked as if Roanoke-Benson would be that team in the second quarter, even including a pair of possessions that saw the Rockets make a three, steal the inbound pass, and lay one in for two. Their head coach, Todd Nafziger, says that the stretch there where that was happening was how the whole game should've gone for his team. "We just played to our potential, like we should've been playing. When we reverse the ball, and look to score off of it, we can put a little pressure on them." The question remained how the Rockets would be able to limit Elmwood star Montana Ledbetter. It seemed fair to say that you can't stop her, but at least limiting her would help the Rockets. That didn't happen. Headed into halftime, the Trojans senior was just one made shot away from a double-double, having brought in 8 points and 10 rebounds after 16 minutes. Her head coach, Marcy Brugger, was quite pleased with how her senior played in the team's first postseason game. "I thought she was very aggressive when she did get the ball. She looked to drive, and she was just in a good attack mode." Yet despite the efforts of Ledbetter, her Trojan squad was still behind headed into the halftime locker room, 26-21. Just when the host Rockets were feeling good about their play in the postseason, that quickly faded. The Roanoke-Benson offense did not carry over in to the third quarter. Elmwood, on the other hand, came out firing on all cylinders, nearly making everything they could get. When you put those two things together, you turn a five-point deficit at half into an 11-point lead with just a quarter to go. That's exactly the turn-around the Trojans needed if they would want to pick up a road victory to begin postseason play. So how exactly did the Trojans finally take a grasp on the momentum after so much back and forth? Coach Brugger says it came down to what was said in the locker room. "We tried to make some halftime adjustments. We tried to clean up our press, and talked about defending the middle a little bit better. When we started doing things the way it's supposed to be done, things started to happen." The fourth quarter was slightly improved for the Rockets, but there was still way too much Ledbetter. On top of that, the Trojans had senior Shelby Glover scoring at a decent pace as well, nearly equaling the stat line of her fellow senior. In the end, a factor that certainly could've contributed to the result of the game was Elmwood's height. Roanoke-Benson didn't have much to counter, and that could've spelled trouble in spots. Also, it wasn't just Ledbetter, but the overall rebounding efforts of the Trojans were impressive. Our tally had them finishing with 42 rebounds on the game. It goes without saying almost, but the Rockets did bring down some key rebounds, particularly off of junior Bailey Leman, but it wasn't enough. 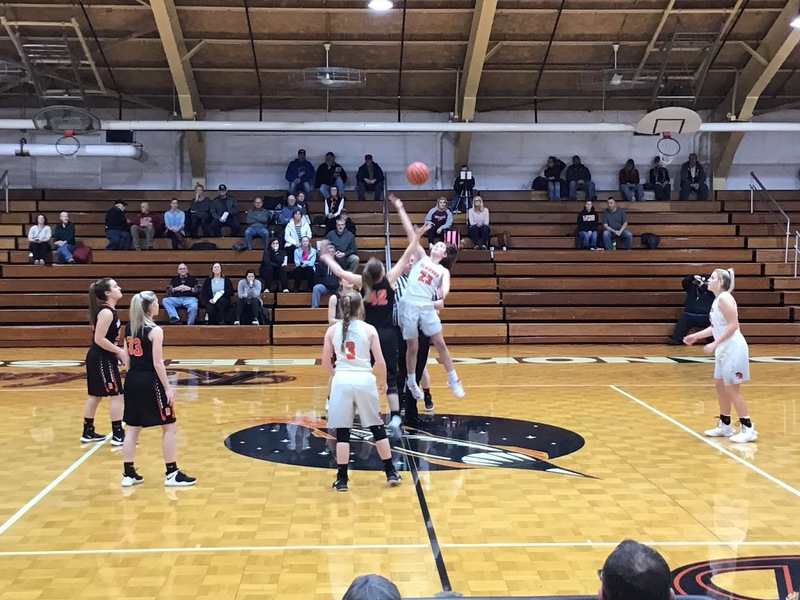 The Rockets would fall on their home floor and end their season with a loss in the regional quarterfinal to Elmwood, 52-35. Worth noting, the Rockets were held to just nine second-half points. Now, it's obvious that the game gradually was slipping away from the hosts and eventually turn into having slipped away. Coach Nafziger says it's an example of not just the regional game. "That's just a sign of our season, basically, in a nutshell. We're so young and inexperienced that when we get in situations like that, teams that are veteran/upperclassmen teams come out and they don't give away the first three minutes of the third quarter. They either maintain the level that they were at or trade baskets. We just have not gotten to that point yet." With top-seeded Illini Bluffs looming on Tuesday night, Coach Brugger says they are "looking forward to the challenge", while adding that they are "going to come our and give it everything we have" against one of the class' top teams. As to what will be the biggest factor for her team to potentially pull out the win, Brugger says it comes down to effort. "I think that we have to have effort for 32 minutes. It's something we've talked about all season. Just have to play hard." With how the Trojans played against his squad, what does Coach Nafziger think would be Illini Bluffs' biggest concern against Elmwood in Tuesday's semifinal? "I think that Illini Bluffs, they're one of the top teams in the state. I think that they will come out and they will try to dictate tempo. If Elmwood can not allow that to happen, then they'll be in the game." Elmwood will play the top seeded and #10-ranked Tigers on Tuesday night at 6:00 pm at Roanoke-Benson.